Hungary’s anti-immigration Prime Minister Viktor Orbán basked Monday (9 April) in a bulldozer election triumph that delighted other nationalists but sent a chill through civil society groups and portended fresh battles with Brussels. After a campaign centred on resistance to immigration and trumpeting a strong economy, nearly complete results showed that Orbán’s Fidesz party snapped up almost half the vote (48.8%). This will give it a two-thirds majority in parliament and a legislative carte blanche to pursue Orbán’s transformation of the central European country into what he calls an “illiberal democracy”. Prime Minister Viktor Orbán won a third straight term in power in Sunday elections (8 April) after his anti-immigration campaign message secured a strong majority for his party in parliament, granting him two-thirds of seats based on preliminary results. Addressing ecstatic, flag-waving supporters in Budapest late on Sunday, Orbán said the “destiny-deciding victory” setting him up for a third straight term gave Hungarians “the opportunity to defend themselves and to defend Hungary”. Opposition parties, which entered the final weeks of the campaign with some optimism, saw their hopes dashed that a high turnout and cooperation in some constituencies might damage Orbán. The head and founder of the far-right Jobbik, Gábor Vona, who has sought to moderate the party, said late Monday that its board had accepted his resignation after it won only 19.3% of the vote. Orbán’s win followed strong election performances from other parties portraying themselves as anti-system such as in Italy in March and in Austria and Germany last year. OSCE monitors said that “xenophobic rhetoric” and “media bias” in the campaign impaired voters’ ability to make a fully informed choice. The public broadcaster “clearly favoured the ruling coalition”. Gergely Gulyas, the head of Fidesz in parliament, rejected the respected international monitoring body’s report. “It is not their task to give a political opinion on the Hungarian election campaign… and to judge the government’s campaign,” he said. 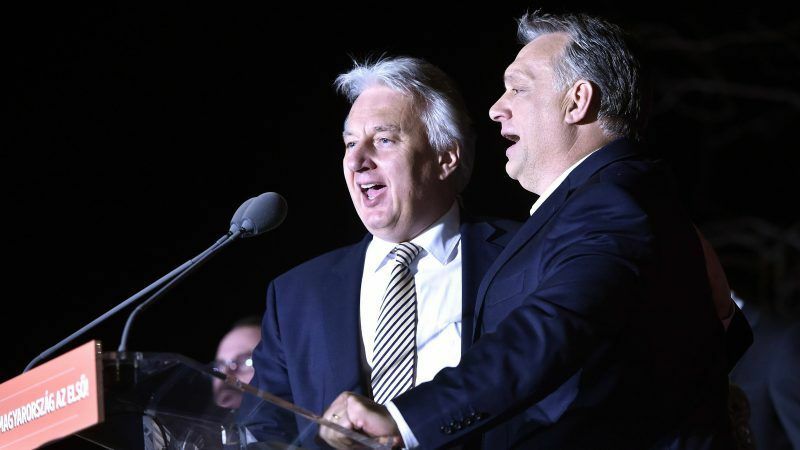 Meanwhile congratulations from allies poured in for Orbán, long a thorn in the EU’s side, who styles himself as the defender of Christian Europe against the “poison” of immigration and the “globalist elite”. In Poland, whose government like Hungary’s has clashed with Brussels over worries about the rule of law, right-wing Prime Minister Mateusz Morawiecki wished Orbán success “for Hungary and for Europe”. Poland’s deputy foreign minister said the win confirmed central Europe’s “emancipation” while anti-migrant Czech President Milos Zeman’s spokesman hailed “another defeat for the dehumanised politics and hate media”. Beatrix von Storch from the Alternative for Germany (AfD) said it was a “bad day for the EU and a good one for Europe”. “Hungary voted with its heart and its head, ignoring threats from Brussels,” said Matteo Salvini, head of Italy’s far-right League and potentially the next prime minister there. L’Ungheria ha votato con il cuore e con la testa, ignorando le minacce di Bruxelles e i miliardi di Soros. Juncker’s spokesman Margaritis Schinas said the former Luxembourg PM would congratulate Orbán in a letter and phone call, but also struck a warning note. “The European Union is a union of democracies and values. President Juncker and the commission believe that the defence of these values and principles is a common duty for all member states, without exception,” Schinas said. In a terse congratulatory note, Tusk told Orbán he was counting on him to “play a constructive role in maintaining our unity in the EU”. The EU has launched a barrage of legal action against Orbán’s government, taking it to the bloc’s top court over a crackdown on education and foreign-backed civil society groups that critics say targets US billionaire George Soros. The European Commission has also brought a case against Hungary, Poland and the Czech Republic over their refusal to accept quotas for asylum seekers. But Orbán has remained defiant in the face of both criticism and legal action from Brussels and the bloc faces a challenge in trying to either cajole or compel him to cooperate. Joachim Fritz-Vannahme, an analyst with the Bertelsmann Stiftung thinktank, said Orbán’s win could be an unpleasant foretaste for Brussels of next year’s elections to the European Parliament. “We already have almost a third of MEPs who are anti-Europe or eurosceptic, from UKIP to Marine Le Pen,” he told AFP. Orban's win in Hungary is a huge threat to the existence of the EU. They can not ignore a fascist with a popular mandate. The EU will have to act or die. Poland will be next if they fail. Orbán’s Fidesz party is part of the European People’s Party (EPP), the dominant force in the European Parliament which also includes German Chancellor Angela Merkel’s CDU party, and some critics say this has given him political cover in Brussels. On Monday Manfred Weber, the head of the EPP bloc in the parliament, congratulated Orbán on Twitter, saying he was looking forward to “continuing working with you towards common solutions to our European challenges”. Left-leaning groups in parliament condemned the EPP’s support for Orbán, with German MEP Sylvia-Yvonne Kaufmann, of the Socialists and Democrats, saying they needed to “talk straight to him, instead of flattering him with visits and invitations”. German Chancellor Angela Merkel also congratulated Orbán, with her spokesman saying that despite differences, Berlin wanted cooperation “within the European framework and the values that unite us”. Orbán, 54, became a household name as a young student in 1989 in the dying days of communism with a stirring speech demanding that Soviet troops go home. As one of the brightest stars in newly democratic “new” Europe, Orbán co-founded Fidesz and anchored it firmly in the centre right with a focus on family and Christian values. The father-of-five learned from a rocky first term as prime minister from 1998-2002. He bounced back in 2010 with a two-thirds majority, a feat he repeated four years later. He shook up the judiciary, brought state media under tighter control and tacked hard right during Europe’s 2015 migrant crisis, building razor-wire anti-migrant fences on Hungary’s borders with Serbia and Croatia. During the recent election campaign he ramped up his attacks on financier and philanthropist George Soros as the malign mastermind of a “global elite” in cahoots with the EU to let in floods of foreigners. At the same time, Orbán has cultivated friendly ties with Russian President Vladimir Putin. He also dismisses Hungary being ranked the EU’s second-most corrupt country by Transparency International. 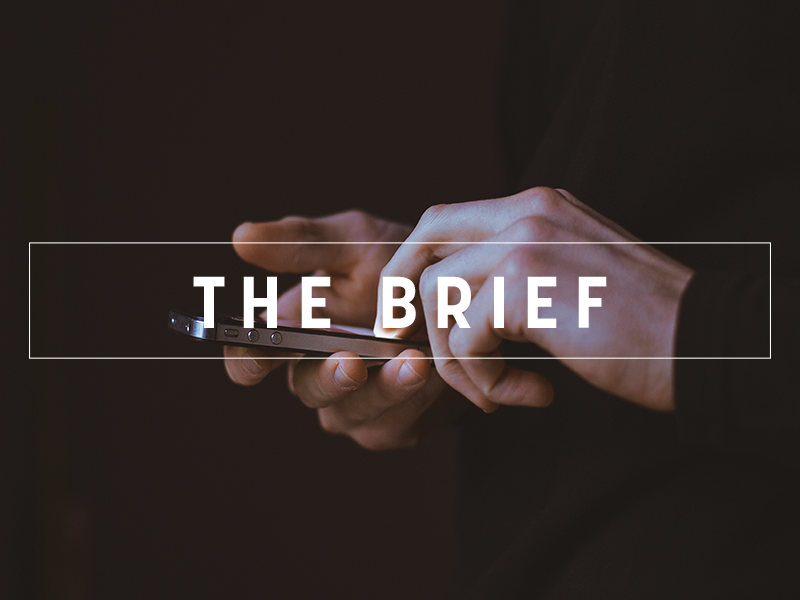 Non-governmental organisations, particularly those funded by Soros — who helped get Fidesz off the ground — have found life particularly hard, and on Monday were bracing for even tougher times. Fidesz spokesman Janos Halasz said on television that bills from a new “Stop Soros” package of legislation would be among the first to go before the new parliament. 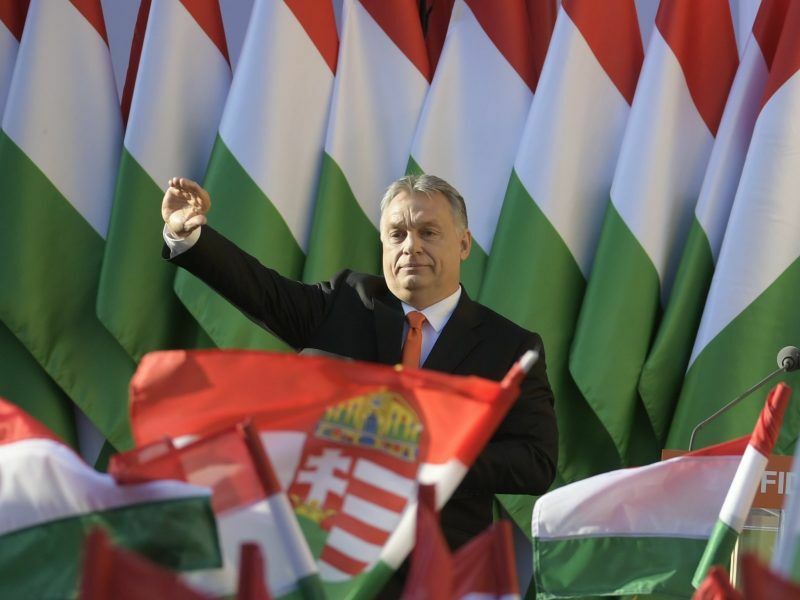 Daniel Hegedus, research adviser at Freedom House, said Orbán’s new victory casts a “dark shadow on the future, especially concerning the attacks against the critical civil society”. Elisabeth Katalin Grabow, a Hungarian-German journalist, said she and her Ghanaian boyfriend are fearful. “How could we have children in this country, where hate and racism are now officially part of the governing party’s policy?” she said. But others were more upbeat. One of the reasons so many voted for Viktor Orbán’s Fidesz yesterday is the good state of the Hungarian economy. Perhaps it is time to think how to drain the swamp in Brussels. Congratulations to Orban and good luck for the future cleaning of Brussels. “shock waves”, oh please. Just your typical corrupt ex-communist country doing what everybody expected: elects a corrupt weasel using the oldest tricks in the populist playbook. Yes the EU should help these countries mature as democracies it already has, but not at the cost of the whole project. If their elected leaders insist on taking right-wing authoritarianism to its logical conclusion they should have that option but outside the EU. Apparently the left-wing version didn’t offer enough data points. A more unified but smaller EU would be stronger anyway. The only trouble is that this would strengthen Russia somewhat but it’s a reasonable price to pay for sanity in Europe. The ex-prime minister of Singapore Lee Kwan Yew was very successful in court against all kind of trash accusing him of corruption. Leftists in EU should take care when accusing somebody as corrupt, because they may also fail to prove their accusations. EU’s anti-corruption agency OLAF is investigating 35 public projects in Hungary. They sited grave irregularities and conflicts of interest. These issues are often reported in the international press but maybe not enough in Hungary, which would not be surprising since under Orban’s rule the country has dropped in the press freedom index from 25th in 1999 to 71th in 2017. If someone is willing to campaign on a platform of xenophobia and conspiracy theories that should tell you something about their immoral proclivities. People tend to be consistent in their lack of ethics. The EU is about to send an even bigger shockwave by introducing a totally anti-democratic electoral threshold for the next European election which is EXPLICITLY designed to make sure parties that oppose progressive totalitarianism don’t get their voices heard.